Cara Boucher, assistant chief of the DNR's Forest Management Division, said, "Given the long-term trend of declining use and the inability to raise camp fee revenues, the only way to absorb the current cut in General Fund support is to close some campgrounds." The order to close the 23 campgrounds will be submitted as a proposal at today's Michigan Natural Resources Commission (NRC) meeting in Lansing, and will be eligible for action by DNR Director Rodney Stokes at the NRC's May 12 meeting in Flint. If approved at the May meeting, the closures would be effective on May 19, 2011. Two Upper Peninsula State Forest Campgrounds on the list are ones which can be used by hikers of the North Country Trail. Having places where camping is allowed is important for long-distance hikers. Most surprising to me is Big Lake in Baraga County. This is a botanical treasure. When I was there in July of 2005, the beach edge was covered with several species of rare plants. 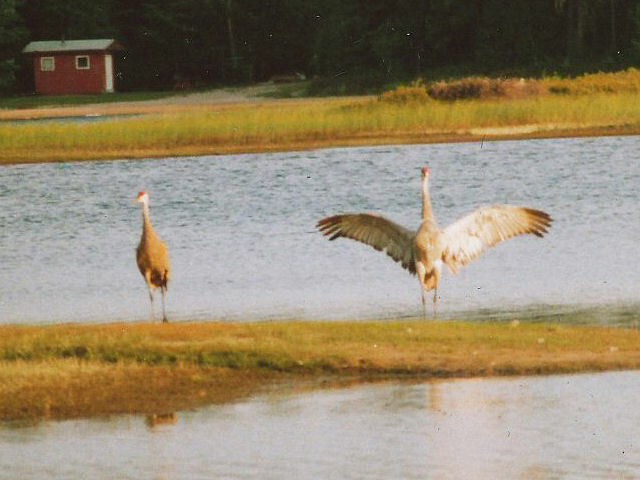 We were serenaded by the Sandhill Cranes. Reed and Green campground in Luce County is a tiny site which adds a key camping location between Culhane Lake and Muskelonge State Park. Can the costs of servicing a latrine and a hand pump twice a year be so burdensome that even though these sites aren't used very much, everyone who does use them needs to be punished?